Competition in the smartwatch market is set to heat up in the coming months, and Pebble has openly embraced the changes brought on by Android Wear. The Pebble Android App 2.3.0 will allow the smartwatch to display and interact with Android Wear notifications, and does a few other things that Google’s smartwatch OS isn’t capable of yet. The Pebble Android App 2.3.0 is still in beta testing, although Pebble is allowing anyone who is interested to download and install it. Of course it is currently only compatible with devices running Android 4.0 and higher, but that OS is old enough that most Pebble users shouldn’t be left out. It allows users to reply to messages with emoji directly from the smartwatch. A feature that isn’t too common on any wearable, although it is of questionable utility. There is also integration with SquareCash; which does not operate in this particular country. 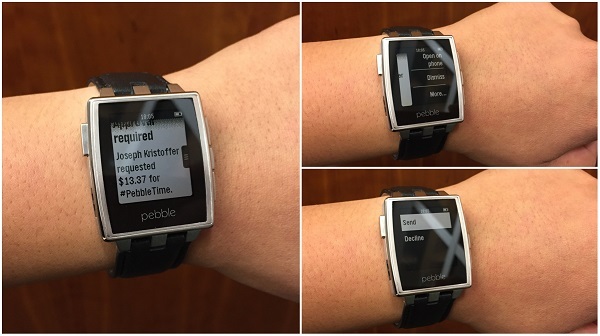 Allowing Android Wear notifications on Pebble is good news for both developers and owners of the smartwatch. It reduces the amount of work needed to support an additional device for devs, and means that they are able to reach a wider audience. Pebble owners can continue to use their preferred smartwatch without feeling left out of new app features, or having to buy a whole new device just to keep up.